FOLLOWING a protest over hike in fuel prices which led to violence, the Government of Zimbabwe has shut down social media. It was gathered that the Zimbabwean government hiked fuel prices to the highest in the world, amid a continuing economic crunch and soaring prices. 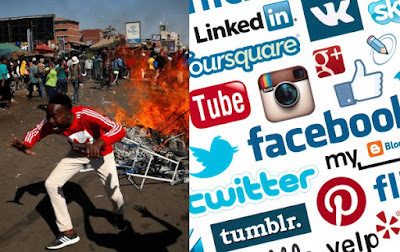 Several Internet service providers according to TechZim, received a government directive on Monday evening to block access to some social media services following the violent protest that ensued. TechZim who advised users who have had their access blocked to install virtual private networking (VPN) software to get around the ban, said many users are unable to access Facebook and the popular Facebook-owned instant messaging platform WhatsApp. Twitter and Instagram have reportedly also been affected. “For the past three hours we have not been able to access WhatsApp. With the government shutting down the internet and social media, it’s the final straw for human rights.